Being a busy Mom of 4 boys is hard enough. When the back to school season runs around, it’s harder. Getting everyone back on a schedule after lay Summer days and lax bedtimes? There should be an award for that, especially since my workload doesn’t take the shift into consideration. I am a stickler for routines at certain times. At bedtime, I can be a drill Sargent if I have to be– but come hell or high water, everybody will be clean, with teeth brushed and fresh undies on and in bed at their designated times. When I was younger though, I tried to control every. little. thing. It didn’t take long for me to learn that with four kids, life was going to delight at throwing my curve-balls. I couldn’t possibly juggle everything all the time, without being willing to throw my hands up and go with the flow sometimes. One of those places where I learned to be more flexible? Dinner time. Despite my best efforts, and ironically considering I cook and develop recipes for a living, it wasn’t always going to be a ‘from scratch’ meal. This is exactly why, if you ever for some reason sneak a peak inside my deep freezer, you’ll always find a couple boxes of Red Baron frozen pizza, from my local Walmart, on hand in my house. Our two favorites being: Red Baron® Classic 4 Cheese and Red Baron® Brick Oven Meat Trio. Speaking of Red Baron, enter their awesome sweepstakes for the chance to win some great prizes! You can’t go wrong with their yummy pizzas, and you’ve got the chance to win some goodies. And that’s 100% ok! I’m still a good Mom. Shoot, when my kids see the box come out of the freezer their eyes light up, and they tell me I’m a great Mom, lol. What’s important is that a healthy supper’s on the table (relatively) on time. Sometimes I need a little help with that. Ain’t no shame in this Mom’s game, and I’m not afraid to admit it. I’ve got the Baroness on my side, and she’s helping to smash the stero-type. We aren’t picture perfect all the time, and that’s ok– she wants you to know it’s ok to embrace life’s imperfections, and that you’ve got a wingmom in her. Don’t be surprised if you see my kid out and about with mis-matched socks either. My only requirement is that the lengths be the same, and no holes with your toes sticking out. Life’s too short for me to worry about, and spend an entire morning arguing over a pair of socks. Just like it’s too short to be so stressed over a home cooked meal. Some night’s it happens, and like I said other night’s it doesn’t. With Red Baron though, it still tastes homemade. And honestly, those nights? I kinda secretly actually look forward to them, because it means a lot less time in the kitchen and more time with my kids– relaxing. Like snuggled up on the couch listening to my rising 3rd grader read me a story. The laundry can wait. So can the phone, because it can’t be anything that important on the other line. Because for the next 16-18 minutes until the timer goes off? There’s nothing getting between me, my boy, and our latest set of favorite characters. Remember earlier when I mentioned life was too short to argue over certain things? Basically a ‘pick-your-battles’ mentality? Another area I choose to adhere to this strategy in? Dessert. Nothing tops off a good meal like dessert. Yes kids, you sure can have dessert. It just won’t be ice cream, and guess what?? It doubles as a side dish to our yummy pizza. Our Cherry Berry Fruit Salad really is the perfect compliment. A yummy, healthy (shhh! we don’t want the kids to hear) dish, this Cherry Berry Fruit Salad is ready in under 5 minutes! Loaded with antioxidants (because let’s face it, back to school means back to germs) this doubles as a fresh, sweet take on dessert. Bursting with fresh cherries and blueberries, studded with diced chunks of kiwi and sprinkled with pistachio pieces- it’s a perfect pairing to a yummy slice of pizza that will leave everyone feeling full and satisfied with their meal. A fresh fruit salad with a little bit of crunch on top, this cherry blueberry & kiwi blend makes a refreshing snack or dessert. In a medium mixing bowl, stir together the fruit until evenly incorporated. Spoon the fruit salad into 2-3 serving dishes. Sprinkle each dish with the crushed nuts. Refrigerate until chilled, or serve as is. 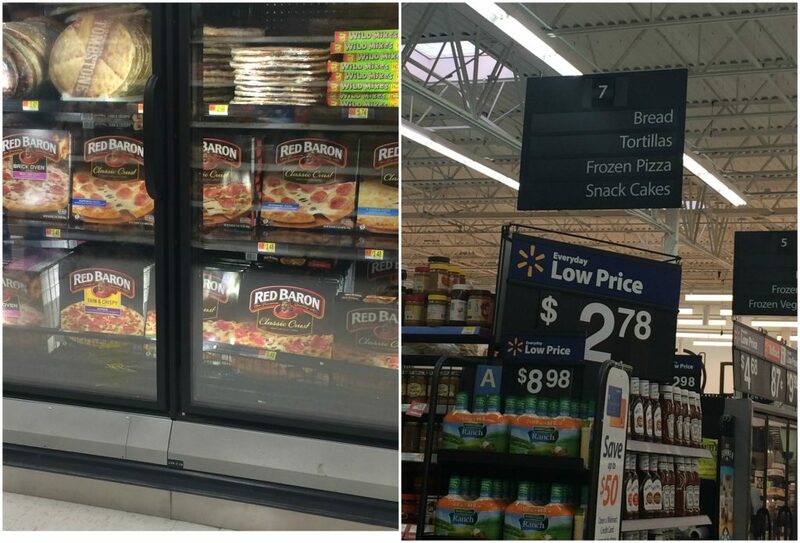 Right now, you can head on over to your local Walmart and grab a few boxes to stock your freezer. Using this awesome Ibotta deal, you can even save $0.75 when you buy 2! The moral of this story Mamas? None of us have it all together, at least not all at once. You’re in good company! So tell me, what’s your Baroness? Right? A win for me and the kids! !